This highly nutritious Organic oil provides a blend of plant seed oils in an omega 3:6 ratio of 1:1 along with GLA and omega 9, for daily maintenance or for therapeutic use. The plant seed oils are naturally rich in the parent fatty acids - linoleic acid, alpha linolenic acid and oleic acid, along with a full spectrum of vitamin E in the form of tocopherols and tocotrienols. This oil is 100% organic, cold pressed, solvent free, nitrogen flushed, and vegan. 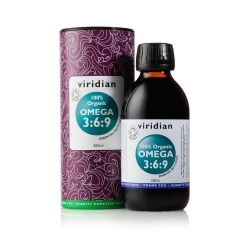 Note: During pregnancy and breastfeeding, it is advisable to use an oil specifically designed for the body's needs, such as Viridian’s Pregnancy Oil. Those with gallbladder or liver disorders should introduce nutritional oils into their diets gradually. Nutritional oils may need to be carefully dosed in those taking anticoagulant medications. 2 - 3 teaspoons daily at mealtimes or as recommended by a healthcare professional.